Until you take those 7 rounds around the fire amidst chanting of the mantras your Indian wedding isn’t complete. The 7 (saat) pheras in Indian weddings are always the highlight of the wedding. The bride and groom make 7 vows to each other which they promise to fulfill to make their married life happier. Ever wondered what they mean and what are you getting yourself into :P:P ( I always nag my husband saying you made this promise while getting married!! ) 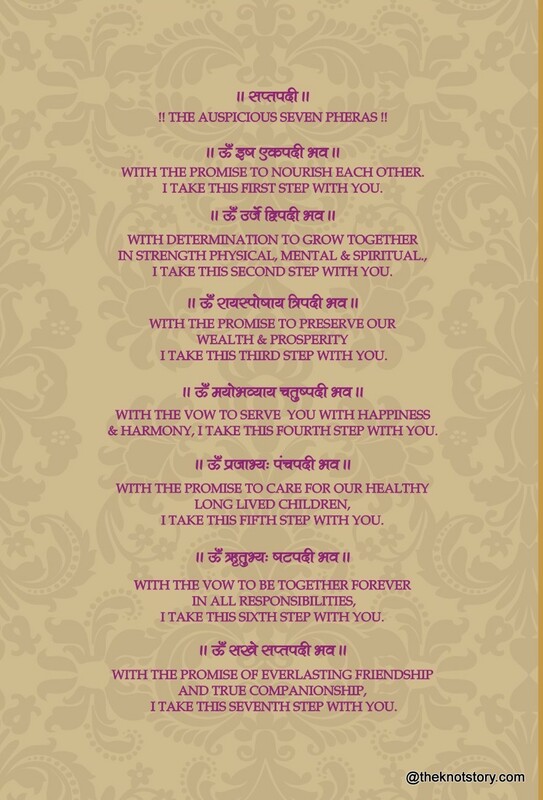 Good to know these vows before you make them to your life partner! I always wanted these 7 pheras to be a part of my wedding card in some way or the other! And my card designer did a very good job! Without much delay here is snapshot of my own wedding card with the 7 pheras explained ! The mantras have their own meaning and we tried to make it as simple as we could in english! There is a very famous hindi song also related to the 7 pheras. Hope you like it and this infoormation is of all the help understanding your wedding vows. This entry was posted in Family, Wedding / Marriages and tagged 7pheras, Bride, Family, Groom, Husband, indian wedding, indian wedding vows, North Indian Groom, Relationships, saat phere, saptapadi, seven phera, wedding vows, wife. Bookmark the permalink.